Located at a distance of about 406 km, Ranchi is one of the favourite weekend getaways for people in Kolkata. Originally, the district was known as Lohardaga, but later in 1899, it was changed to Ranchi after the name of a small village. The word Ranchi is derived from the word "archi" which means bamboo grove. During the British era, Ranchi was the summer capital of Bihar and hence, it has a lot of history of that time. Tourists can visit Ranchi anytime throughout the year. However, months from July to March are said to be the ideal time to visit this capital city as it has a subtropical climate and is extremely hot and humid during the summer. In Ranchi, the summer temperature varies from 16 degree Celsius to 36 degree Celsius. But, the winter season is quite pleasant for sightseeing as the average temperature ranges from 15 degree Celsius to 25 degree Celsius. In the month of January, the temperature sometimes drops down to 1 degree Celsius along with thick dense fog. During the monsoon season, Ranchi receives moderate rainfall and the weather is comfortable for tourists to have good holiday. By Air: Ranchi has its own airport named Birsa Munda Airport, which is located in Hinoo around 5 km from the city centre. Direct flights are available from Kolkata to Ranchi and it will take you about 1 hour to fly from Kolkata to Ranchi. By Train: The Ranchi Junction railway station is well connected to almost all the major cities in India. From Kolkata, you can board a direct train from Howrah Junction and reach Ranchi approximately in around 7 hours. 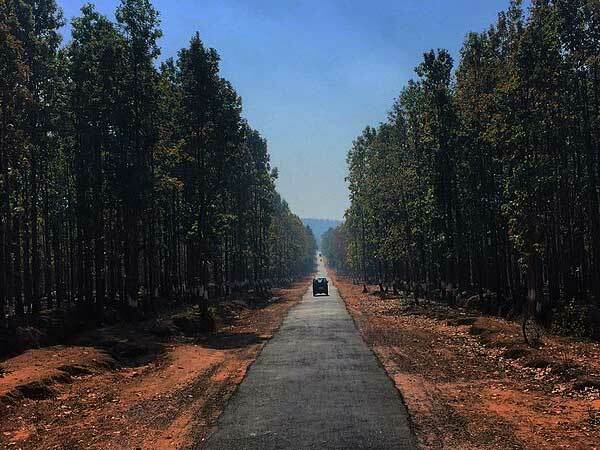 By Road: Ranchi is located at a distance of about 406 km from Kolkata and is well connected by roads. It will take around 8 hours to complete the journey from Kolkata to Ranchi. If you are planning to travel by car, then route 1 is the preferred route as it provides a beautiful scenic view throughout the journey and gives a glimpse of the rural life in West Bengal. Ranchi is the state capital of Jharkhand and is one of the favourite tourist destinations in India. From hills, lakes, falls to wildlife, this small city has an array of attractions for its visitors. Situated at an elevation of 2,140 feet above the sea level, Ranchi is covered with red soil. If you are planning to visit Ranchi this monsoon, then here is a list of attraction such as the Sun Temple, Hundru Falls, Dassam Falls, Ranchi Lake and Panch Gagh Falls, which are must-visits for you. Panch Gagh Falls is one of the exclusive tourists spots that you can enjoy on your road trip to Ranchi. The waterfall is located at a distance of 55 km from Ranchi is a tributary of the Banai river. Panch Gagh Falls has five waterfalls that cascade through steep rocky hills near Khunti village. The foot of the waterfalls is an ideal place for a picnic or a weekend getaway. Ranchi Lake is a man-made waterbody that was constructed in 1842 by Colonel Onsely, who was a British national. Situated at the foot of the beautiful Ranch hill, this lake is another perfect location for family outings and has boating facilities as well. Tourists, willing to explore more, can also visit a Shiv Mandir at the top of Ranchi hill, which is a popular tourist destination. Located at a distance of about 39 km from Ranchi, the Sun Temple is one of the religious attractions in Jharkhand. The temple was originally built by Sanskrit Vihar and is now run by Shri Ram Maroo. This temple is dedicated to the Sun God who can be seen seated on a lotus flower inside the temple. The shape of the Sun Temple resembles a big chariot with 18 wheels and 7 horses. The Hundru Falls stand at an elevation of 320 feet and creates a stunning landscape for the tourists. Located at a distance of 45 km, this falls is one of the most popular waterfalls in India. Hundru Falls, which is a part of the Subarnarekha river, is a perfect place for a weekend getaway. This falls has been named as the highest waterfalls in Ranchi and 34th in the country. Located in a small village called Taimara, Dassam Falls is another popular tourist spot in Ranchi. This falls that falls from a height of 144 feet is also a tributary of river Subarnarekha. Located at a distance of 40 km from Ranchi, Dassam Falls attracts a lot of tourists throughout the year, especially during the weekends. There is a wide variety of wild animals at the Birsa Zoological Park, which is situated on the Ranchi-Patna National Highway near Ormanjhi. This park also has an animal adoption program and allows visitors to adopt an animal and contribute it to the wildlife preservation drive. Jonha Falls is located at an edge of the Ranchi Plateau and is often referred to as the hanging valley falls. This falls is also known as the Gautam Dhara as it is believed that Lord Buddha bathed in this falls. At the top of the Gautam Pahar, Raja Baldevdas' sons built a Buddha temple and an ashram. Originally, this ashram was mainly associated with Hindus, later other religions such as Buddhists, Sikhs and Jains also started coming here. Tagore Hill, which is also commonly known as the Morabadi Hill, is one of the major attractions in Ranchi. The hill had an ashram of Jyotindra Nath Tagore, who was the elder brother of Rabindranath Tagore. It is said that Rabindranath Tagore used to sit here and spend time writing poems. Since then, this hill was named as Tagore Hill. People who love to visit calm and peaceful places will surely like visiting this place.